The American River is one of the region’s most significant environmental and recreational assets. As early as 1915, the City of Sacramento envisioned a parkway along the river. Today the American River Parkway attracts nearly as many visitors per year as Yosemite National Park. For the neighborhoods west of Howe Ave., the American River is mostly accessible from the north side, via the paved Jedediah Smith Memorial Trail (AKA ARP bike trail). West of H Street, the only paved access on the south side is the Two Rivers Trail, which currently runs between Tiscornia Park and Hwy. 160 and between Sutter’s Landing Park and the Union Pacific Railroad bridge, a 0.7-mile segment that opened in January. 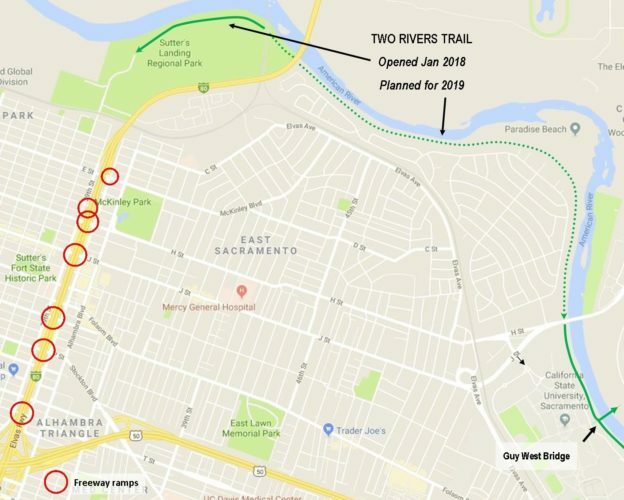 The City of Sacramento is currently designing the next phase, a 2.4-mile stretch from the Union Pacific RR bridge to H Street tentatively set to open in 2019. The City has received a $3.3 million grant from Senate Bill 1 gas tax revenues to design and build the trail. The project would pave the existing dirt maintenance road at the base of the levee that’s been open to the public for more than 50 years. 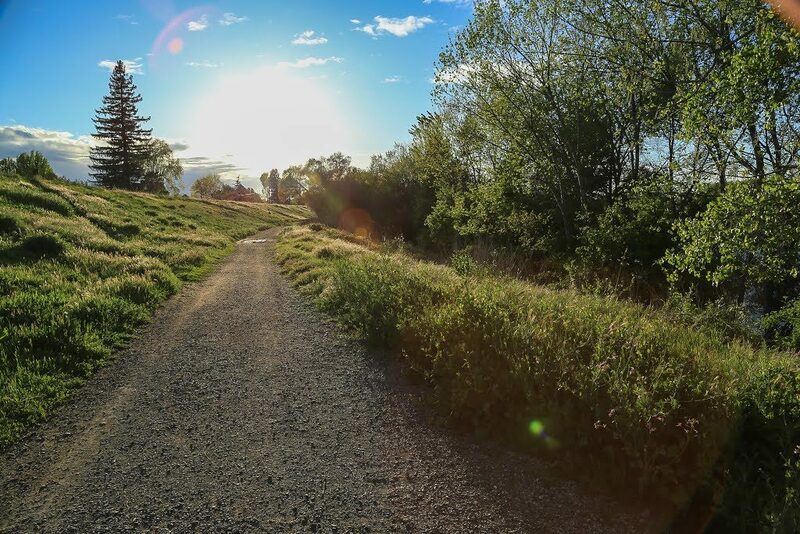 The paved trail will be used for walking and biking as well as for levee maintenance vehicles, and will include decomposed granite shoulders for walking and running. When completed, the Two Rivers Trail will run continuously between Sac State and the Sacramento River, giving more access to the south side of the Parkway, and creating a second connection between the American River Parkway and the Sacramento River Parkway, and, eventually, the Great California Delta Trail and El Dorado Trail. For people on bikes traveling between the American River Parkway and the Grid via Sac State, the trail would provide a continuous, calm, off-street alternative to routes through East Sacramento that all involve dealing with heavy traffic at 29th Street, 30th Street and Alhambra Blvd., and traffic heading to and from Capital City Freeway ramps at E, G, H, J, N, P, Q and T streets. This alternative could even help get cars off the road. For every person currently riding a bike, there are five drivers who say they’re interested in riding for transportation, but not willing to share the road with motor vehicles. Creating conditions that attract these drivers can help reduce vehicle traffic and improve regional air quality. Later this summer the City of Sacramento will issue its draft environmental analysis of the project for public comment. This entry was posted in Blog on April 2, 2018 by SABA.